Watch movies during this Monday movie night in Koh Samui from your beanbag or day bed. Take in the peaceful surroundings of the Gulf of Thailand. Enjoy the calmness of the sea and order food from award-winning restaurants Namu or Beach Grill. 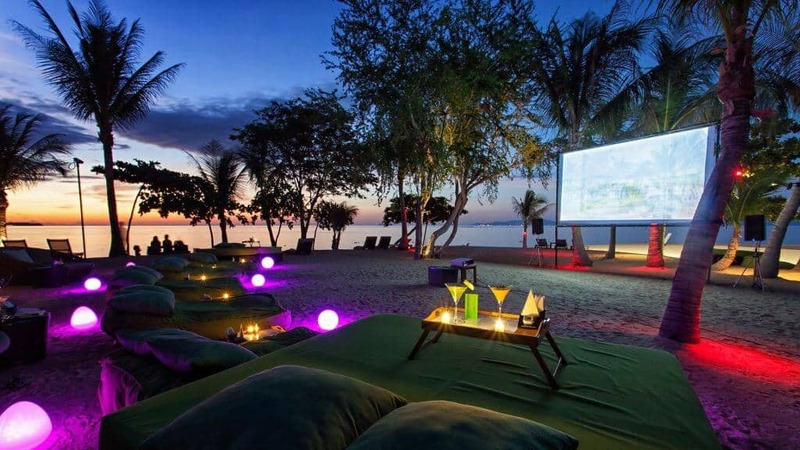 W Koh Samui presents a Koh Samui movie night. It sounds familiar underground and classic films under the stars. Watch movies during this movie evening from your beanbag or day bed. Take in the peaceful surroundings of the Gulf of Thailand. Enjoy the calmness of the sea and order food from award-winning restaurants Namu or Beach Grill. The movie night starts at 8 PM sharp every Monday throughout the year, but you are welcome to sip from your favourite drinks during sunset. Buy one and get one free, excluding wine, craft beer or champagne already begins from 4:30 – 7 PM for moviegoers. Different films are screened each Monday, so it is refreshing to sit in, watch and relax. The nights have free entry, but a minimum purchase applies for guests who are not staying at the resort. Weather-related cancellations might apply.